WHERE CAN I REDEEM MY ¡HOLA! CARD? This is a personal card that identifies you as a client. You can use it to exchange products contracted by you or allocated by ¡HOLA! In no event shall the ¡HOLA! Card be used as a payment means. When placing an order on our web page (a subscription or the purchase of other editions as allowed on the website), ¡HOLA! will send the card to the address that has been registered. The ¡HOLA! Card will be delivered within a term of approximately 10 business days, at no additional cost. WHAT PRODUCTS CAN YOU EXCHANGE WITH YOUR CARD? Any product you have contracted with us or products allocated by us via promotional action. HOW CAN I GET MY PRODUCTS REGISTERED IN THE SYSTEM? When processing the exchange at the point of sale, the system will check whether you have been pre-allocated the right to exchange that product. 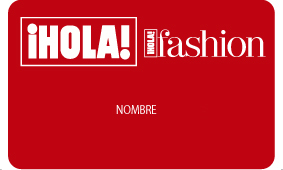 By purchasing subscriptions or individual issues or as a direct allocation by ¡HOLA! under Promotional Rights, your exchange rights will be registered in a file allowing them to be delivered to you. The ¡HOLA! Card may be used at points of sale that have adhered to this system. The ¡HOLA! Card is valid only within the territory of Spain. Exchange rights have an expiry date. Subscribers will lose their entitlement outside the given dates. In the event of loss, substantial deterioration or theft of the ¡HOLA! Card, clients must report it as soon as possible by entering our web page https://sercom.hola.com / (www.tarjetahola.com) Contacto. Replacements will entail a charge of 3 euros to be borne by the client. The subscriber will be the sole party liable for the fraudulent or undue use of the ¡HOLA! Card in the event of loss or theft before the client reports that event, which can be done by entering our web page https://sercom.hola.com / Contacto. By using the ¡HOLA! Card you expressly accept these General Terms and Conditions. The products that are acquired shall be adjusted to the General Terms and Conditions of Sale and Subscription of HOLA, S. L.